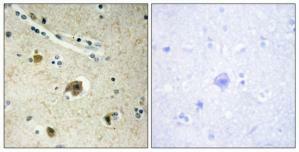 Immunohistochemistry analysis of paraffin-embedded human brain tissue, using Collagen IV alpha4 Antibody. The picture on the right is treated with the synthesized peptide. 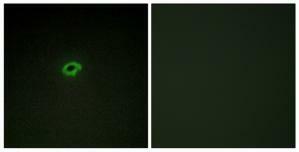 Immunofluorescence analysis of COS7 cells, using Collagen IV alpha4 Antibody. The picture on the right is treated with the synthesized peptide. Immunohistochemistry analysis of paraffin-embedded human brain tissue using Collagen IV a4 antibody.The picture on the right is treated with the synthesized peptide. Immunofluorescence analysis of COS-7 cells, using Collagen IV a4 antibody.The picture on the right is treated with the synthesized peptide.